Rising from the ashes of one of rock’s most notorious lost albums, Getintothis’ Del Pike looks back on 45 years of Who’s Next. Who’s Next. Look at the apostrophe and lack of question mark. Despite the cheeky accompanying cover shot of the band taking turns to pee against a concrete monolith, this is not a question but a statement. 45 years ago, this statement was as enigmatic as it remains today. An in-joke of sorts, possibly referring to the mammoth success of their previous album Tommy, an album that changed the world’s view of The Who forever, transforming them from an upstart semi-constructed mod band from West London to an Eight legged rock beast. How to follow that? May as well just call it Who’s Next. To question the album’s longevity as a fan favourite and regular feature in magazine polls, it needs to be placed in context, so here’s one way of doing so; it must have been exhausting being a Who fan in the 60s. Their debut album, My Generation in late 1965 was hardly the experimental platter that the times were demanding. Time spent forming their sound as The Detours and The High Numbers set them behind their contemporaries and their RnB heavy debut was up against The Beatles’ Rubber Soul, The Stones’ Out Of Our Heads and The Kinks’ Kontroversy, all albums that were playing around in the studio at the dawn of psychedelia. Those happy with the rootsy, re-produced live sound of The Who, their Goldhawk Road followers, may have been satisfied with this collection of covers and raw early Townshend compositions, but they very soon came face to face with a markedly different Who with A Quick One the following year. The album still featured the three minute pop songs of before but also introduced their first mini rock opera in the form of A Quick One While He’s Away. Manager Kit Lambert had influenced Townshend with his tastes in the classics, and this ramshackle collection of ditties, glued together to form a saucy narrative was the uneven outcome. It was also a taste of things to come. 1967’s The Who Sell Out (A play on Beatles for Sale?) was a concept album of sorts to rival Sgt Pepper, a minor threat but a great album nonetheless. With each song linked by a Radio London jingle or fake commercial this was Radio Who and it spoke to the transistor teens of the time with absolute clarity. Teen angst in tracks like Tattoo and Our Love Was rallied against the psychedelic bombast of I Can See For Miles, a song that firmly established The Who as serious rock contenders. The audience now happy that The Who had settled for a recognisable “sound” were so wrong, 1969s Tommy was a game changer that not even the most die-hard Who fan could have predicted. A double album that told the tale of the titular deaf, dumb and blind kid, a whizz at pinball and a spokesman for a generation. Touching on themes of disability, child abuse and faux religion, the album was deemed sick by the music press (“The Who’s sick opera” cried NME) and disregarded by many as a band on their way down. Fans however, loved it and football stadiums across the world were duly filled. What stands out now when listening to Tommy is the muted production of the original recording. What should have been a pounding, three dimensional rock opera fell short of its aspirations. Luckily, many reworkings, stage productions, live outings and a Ken Russell movie later, Townshend’s masterpiece somehow hit its mark. When they took Tommy on the road, Roger Daltrey finally found his true voice. Struggling to find his place with the piercing cries and thuggish delivery of his early recordings, through heavy touring of Tommy he mutated into a beautiful thing. His vocal range expanded and suddenly he was reaching notes he would previously have only dreamed of. His waxed down mod bob had also broken free into a cascading bonnet of golden locks, supplemented by a bare chest and suede fringed jackets. Townshend had taken to wearing his now trademark white boiler suit and Doc Martens, whilst Entwistle and Moon had fast become the most formidable drum n’ bass on the planet. So what could follow up that mammoth period of The Who’s career? 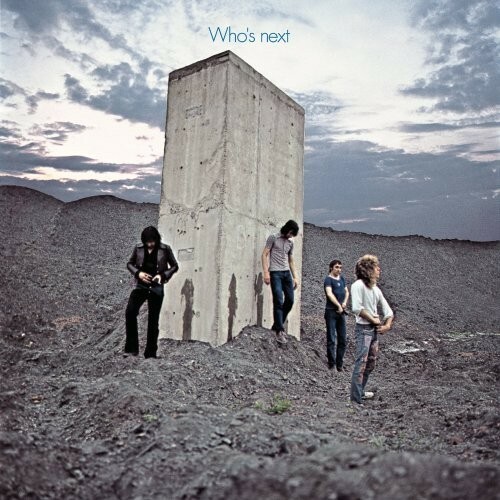 Who’s Next at first appears to be a solid, in your face rock album, an antithesis of the complex musings of Tommy. The mix is right up front with rousing chorus’s and instantly strummable melodies, but this was no rush job and Who fans once again needed to re-adjust. Townshend’s self-confessed madness had been manifesting in his long drawn out Lifehouse project, that to this day continues to baffle many, including Townshend. At different moments it was reported to have been a planned film, a happening, a show and simply an album. Which was it really? Who knows? Under the philosophical influence of Townshend‘s spiritual Avatar Meher Baba, we at least know the original plan was for another rock opera but this time with a science fiction setting. The idea moved onto an experiment with teenagers at series of shows at London’s Young Vic, where the songs would supposedly write themselves. Travelling twice as fast as on any freeway. The lyric is clearly about sharing information in the ether. So in 2016 replacing the word “relay” with the word “internet” and the idea makes much more sense. At this point Rog, Keith and John where becoming increasingly impatient and wanted The Who to get back on track. The sci-fi-ro-op was abandoned, with the remnants of Lifehouse finding it’s way onto Who’s Next in more traditional form. The frenetic keyboard sections were originally meant to reflect Baba’s personal data, fed into a computer and replayed, again as part of Lifehouse. This idea was abandoned and replaced with a style influenced by Terry Riley. Whatever the origins, this remains a tour de force, an album opener like no other. The rest of the album fluctuates in styles and only truly reaches these heights of magnitude again with it’s epic Won’t Get Fooled Again closer. Bargain keeps up the energy and once again its simplicity as a sweet love song is a smokescreen for its actual intention. This is a song about being accepted not by a woman but by God (or Baba). The slowed down, humbling middle section, delivered by Townshend “I sit looking ’round /I look at my face in the mirror /I know I’m worth nothing without you” is a direct link to the attitudes of Baba’s teachings but also predicts the style of the album’s follow up, Quadrophenia. It is easy to imagine that album’s protagonist, Jimmy Cooper, musing over the lines in his suburban bedroom. Love Ain’t For Keeping is a cosy country tinged ballad that hints at what was to come in 1975’s The Who By Numbers, provides respite before John Entwistle’s big brassy explosion of My Wife. As with Boris the Spider from the aforementioned A Quick One, Entwistle finds himself once more in comic mode as he flees his disgruntled wife after a night on the lash. The terrified bassist considers buying a tank and an aeroplane to defend himself before a wondrous burst of brass defines the track and plays it out. As with many great albums there is a fallow stretch in the middle and Who’s Next is no exception. The trio of The Song is Over, Getting in Tune and the uninspired Going Mobile, offer little to those in search of previous Who style thrills, with their workman like approach. Technically sound, but a little uninspiring when placed next to Behind Blue Eyes, a true Who classic. Starting off as a slow ballad and building into the wall of sound that Who fans paid good money to hear, Behind Blue Eyes presents Townshend at his lyrical best. The song, another Lifehouse survivor, refers to Meher Baba’s teachings on restraint from carnal temptation. A situation Townshend had been challenged by on countless occasions. How much of Who’s Next makes it into our The Who Top 10? Click here to find out. Won’t Get Fooled Again, one of the most resounding closing tracks in the history of the rock album has everything a Who fan could desire. Keith Moon’s stick work has never sounded more powerful, Daltrey manages to remain breezy and arrogant simultaneously and each turn offers something new, from exhilarating synthesiser passages to heaven sent Townshend riffs, Entwistles pounding basslines and Daltrey’s athletic larynx. His deafening scream at the climax of the track’s forever-long synth exercise, still sends a shiver down the spine and is a true rock moment. The complex synth patterns are a result of Townshend’s inputting of a group of young interviewees heartbeats, brainwaves and astrological charts into the mix in the form of audio pulses. This was another remaining idea from the Lifehouse project, as were the lyrics. Whilst they may speak to many a generation about sticking it to the man, and the trials of modern life “Meet the new boss, same as the old boss”, they link directly back to the Lifehouse story and characters. The fact that such a great album could rise from the ashes of such a failed and over-ambitious project begs the question of how much greater it could have been had Towshend allowed his flight of fancy to fully form, sadly we will never know. So prolific was the output of The Who at this time that the songs released as B sides and also-rans are as essential as anything on the album, if not better in some cases. Special editions of Who’s Next featuring such gems as Pure and Easy, Naked Eye and I Don’t Even Know Myself are an absolute must and reflect the high standards that The Who were striving for as they entered the 70s. The opening lines of Pure and Easy appears in Who’s Next‘s The Song Is Over and was considered to be one of the central songs to the abandoned Lifehouse. In this song, the story reaches it’s spiritual apex as the meaning of life was revealed to be a musical note (this being the only concept that Daltery was able to grasp). The tight production and hard hitting performance of Quadrophenia which followed in 1973 was very much a result of the successful response to Who’s Next and The Who finally offered a rock opera with the ballsy production that Tommy sorely lacked. As for Lifehouse, Townshend continued to hold out for the project in many forms for decades. Like Brian Wilson and the Beach Boys‘ unrealised supposed masterpiece SMiLE, it was the one project he just couldn’t let go. It has resurfaced numerously throughout his solo career; a radio play, a book, online software. His 1993 solo album Psychoderelict also continued the themes. The obsession culminated in the 2000 six disc box set The Lifehouse Chronicles. Yet as an entry point to 1970s Who, Who’s Next is the key. It is lean compared to the rock operas it nestles between, contains some of the best material the band ever produced and is a solid reminder of how they became one of the most enduring and celebrated rock acts that Britain has produced.